Why use even use mig welding procedures? All I gotta do is crank it up until you hear bacon frying.,,, Then I just weld the dog piss out of it. Ever heard that kind of argument? It even works sometimes….but sometimes it does not work. and That’s a problem..
Why? Because mig welding is more likely to have lack of fusion than any other process. Short circuit mig welding that is. That is why that even welding codes that allow for prequalifed welding procedures in other processes do not allow prequalifed mig welding procedures to be used for short circuit mig. Its forbidden. The codes make you qualify your own procedure for short circuit mig. I can here the lawyer now...So Mr. Quality manager, what process was used for this work platform that failed? Was the welder qualified? Yes sir my welder was certified and qualified. Well what about the welding procedure? was a qualified welding procedure used? er... umm.. Lets be clear, Since the term Mig welding is often used to refer to flux core arc welding (fcaw) as well as gas metal arc welding (gmaw), and all the different variations of gmaw like spray transfer and globular transfer welding, Its important to know that in this article, I am talking strictly about the need for developing and following procedures for short circuit transfer mig welding (gmaw-s). So what is it about short circuit mig that makes it so susceptible to getting lack of fusion and cold lap? I think one reason is because there are no built in limits to the mig process. Wire speed and voltage can be set extremely low and the machine will still run a bead. Lets contrast this with Stick welding (smaw) procedures. With stick welding (shielded metal arc welding), There is a built in limit and that is it is much more unlikely that any welder will set the amperage low enough to the point where cold lap will occur because it takes a certain amount of amperage to light the rod and keep it lit. Mig welding on the other hand has voltage and wire feed settings that are controlled by the welder and there is no point at which the rod sticks or the machine just wont run. 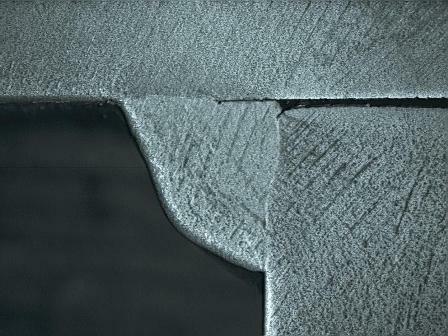 Its up to the welder to set the machine correctly and if mig welding procedures are not developed and proven out by testing and then followed in production, there is every chance the weld will be cold lapped. Part of the reason is that good mig welding procedures are not developed and then followed. One guy sets the voltage like this, the other like that. One sets wire speed low, the other high. And they both argue about who is right. And unless the welding machine is equipped with preset programs and lockouts to keep parameters consistent, welders are free to monkey with the settings in a trial and error fashion. And that might be ok for a muffler shop, but what about a shop that builds nuclear waste disposal tanks? or work platforms...or articulating boom devices, or cranes. If you are going to use short circuit mig for critical welds, the procedure needs to be qualified. If you dont do it, be ready to answer the lawyers questions about due diligence. 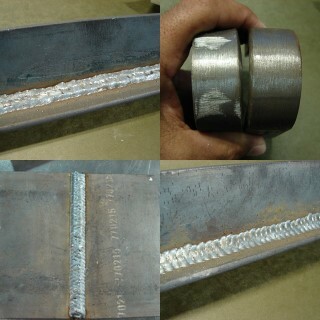 some of the essentials required on a mig welding procedure are:voltage, wire feed speed, wire type, gas mix, flow rate, wire diameter, and any special technique that was required to get the results.